This post will be the first in a sporadic series called From Start to Finish. As I'm sure a lot of you do, I find quilt inspiration in many unlikely places--flooring, rugs, pillows, tile, upholstery. I'll take you through my design process, from initial inspiration to completed quilt. Welcome to the first edition. If you are here from the Sew Timeless blog, thanks for stopping by. If you have followed me for any length of time, it will come as no surprise that I have a special love of working with solids. So a few months back, when Hayden from Timeless Treasures contacted me about possibly doing a project with their Soho Solids line, I jumped at the chance. It seemed perfect for a design idea that had been floating around ever since I saw this picture in a magazine. I started sketching the idea on graph paper, changing the design from a hexagon to an octagon. Then this arrived in the mail. Beautiful colors and the fun black and white stripe. You can see my design changes in this first practice block. The first completed block, which is 12 1/2 inches unfinished. If you have ever made a kaleidoscope block, then you will be familiar with the construction techniques. I used a Marti Michell ruler, which is great especially if you decide you want to make the block larger or smaller. You can also use this pdf template (although I have never tried to embed a pdf so you may have to email me and I can send it to you--the template should measures 6 1/2 inches from top to bottom). This particular block first involves making strip sets, and from then on the construction remains the same. For each block, I cut three 1 1/2" strips of A, B (always the black and white stripe, although I considered changing its placement in one of the blocks--so that might be a fun idea to try), C, and D, and three 2 1/2" strips from E. Cut one white square and one black square, 4 3/8". Trim in half diagonally. Because I was working with fat quarters, it required making three strip sets for each block. 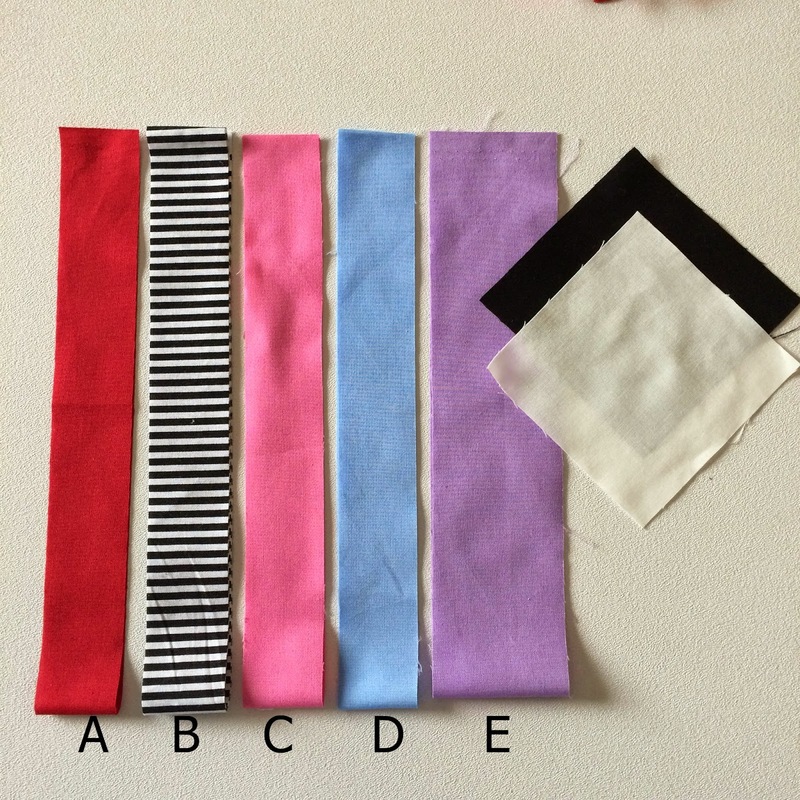 When the strips are cut, it is time to sew. 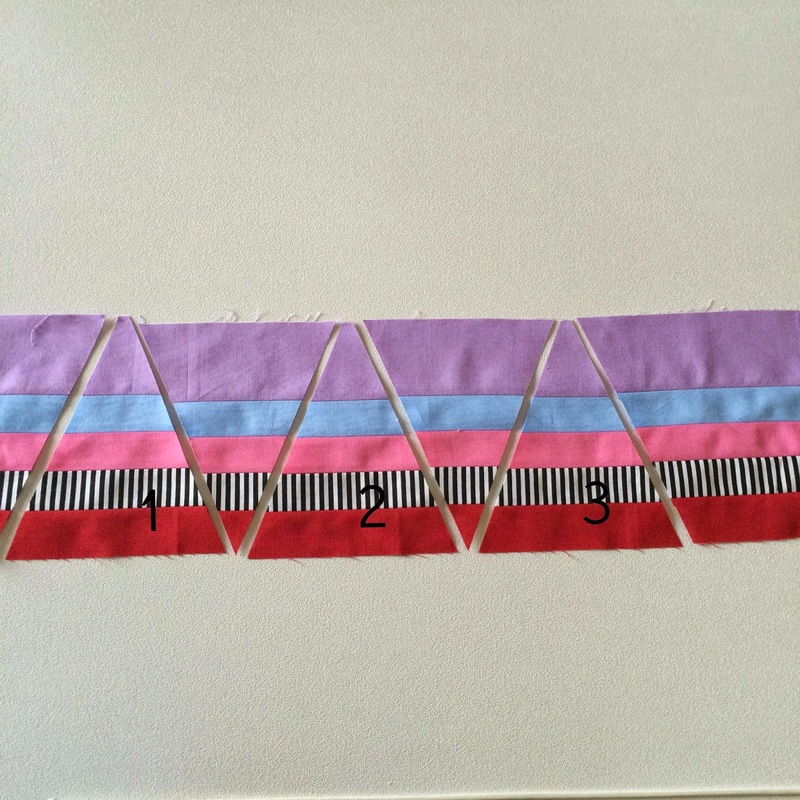 There are different opinions on how to sew strip sets together, and how to keep them straight rather than curving. Because these were each relatively short strips, for each set I sewed A and B together, then C, D, and E together. Your strip set should be 6 1/2" wide. I then pressed the seams open, and then sewed those two sets together and pressed that seam open as well. With one block I tried pressing the seams to the side rather than open, hoping that the seams would nest together in a future step, but that ended up not working well for me. Maybe you will have better luck, so use the system that works for you. Using your template or ruler, cut the kaleidoscope triangles. You should be able to get three from each strip set. Set the remaining pieces aside, not just the triangles, but each end piece as well. Cut kaleidoscope triangle wedges from the remaining two strip sets until you have eight for your block. 1. Take two kaleidoscope wedges, place right sides together and sew from the wide edge to the point, to form four sets. After sewing the sets together, press the seam to one side; be consistent, so all the seams are pressed in the same direction, either clockwise or counter clockwise. 2. Take two of these units and sew them together, again from the wide edge to the point, again pressing the seam to one side. There are now two halves of the kaleidoscope. 3. Carefully line up the two halves, making sure that the seams match. If all the seams have been pressed in the same direction, the center seam should nest together nicely. For good measure, stick a pin in the center to hold it in place. Sew the two halves together. 4. 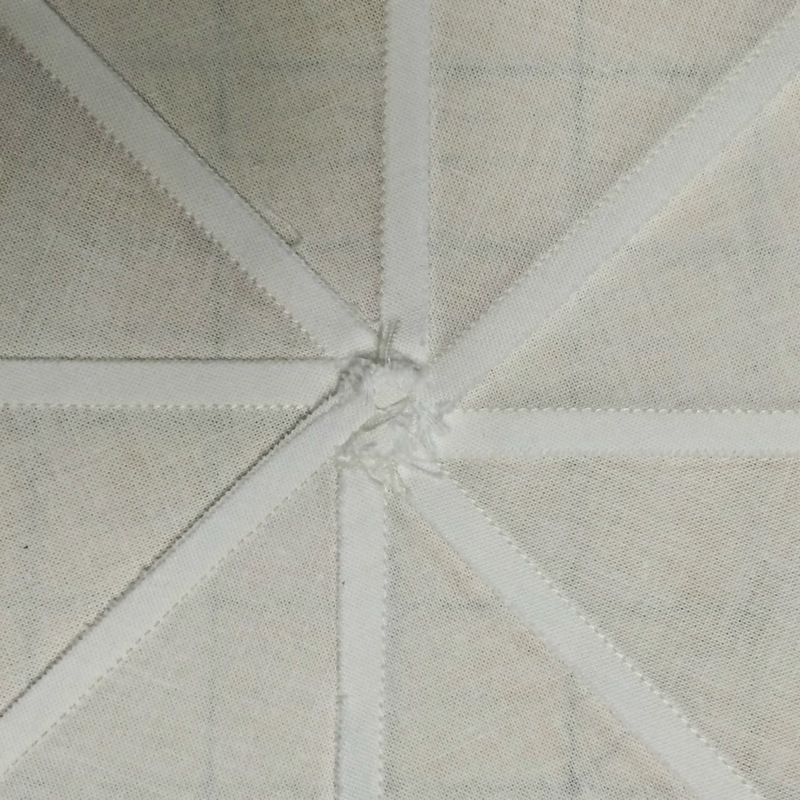 When pressing the center seam, again press the seam in a clockwise or counter clockwise fashion, which will create a little pinwheel at the center. This will help the block remain flat where the bulk of all the seams come together. 5. Cut the white square and black square in half diagonally, and sew on opposite corners. Press. Trim to 12 1/2". Your completed blocks will look like this. You could stop here or keep going with as many blocks as you like. For the Bullseye quilt, I made 12 blocks. I knew I also wanted to use the stripe for the binding, but all these blocks needed a little breathing room before adding that striped binding, so I added 1 1/2" strips of white and black as an outside border. Now comes the really fun part. At least I had a blast. Remember all those leftover triangles and edge pieces from the strip sets? Start sewing them together. Don't try to plan. Just start sewing. First I sewed all the triangles together.Don't they look cool when you alternate them up and down? Then I sewed on the right and left ends of the strip sets. Sometimes I had to cut a triangle in half to have a straight edge. I didn't give it much thought, but just had fun. It ended up looking like this. Then I determined the size I needed for the back and sewed some of the shorter strips together. And then it looked like this. By then I had completely fallen in love with the back, so much that I briefly considered making two separate quilts so the "back" could star on its own. In the end, it became a two-sided quilt. I took it to our local archery range, thinking I could get a cool picture draped over a target. I was imagining one of those large round targets made from hay, with the bullseye in the middle. Um,no. This was the best I could do. If only I had had some help to hold it open below the archery sign. I hope you will give the Bullseye blocks a try. If you have any questions whatsoever, don't hesitate to contact me! I'm working on a new From Start to Finish and you can catch progress shots on Instagram-- @liveacolorfullife. Wow, two amazing quilts "tops" very nice. 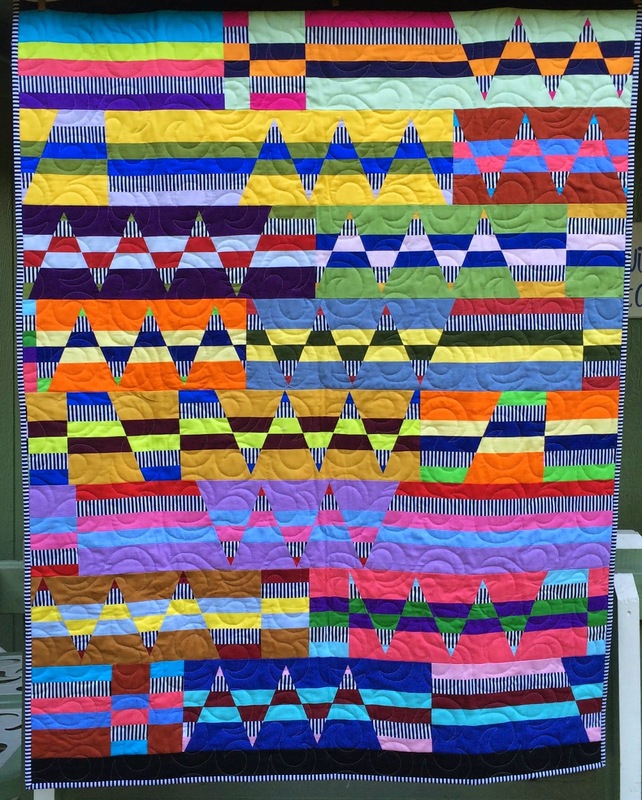 What amazing quilts you have made! They are so bright , they can't help but make me smile! WOW! I really do love the front. So bright and bold...but that back! Just goes to show you, never throw away scraps or leftover pieces! Just beautiful! You are so talented Cindy! This is spectacular! Very cool, and the back side is pure genius! Thanks for sharing your process with us. Great front, but I really really love the back! Love the first quilt! Your stuff is awesome and I LOVE that it's so original! Super crazy cool quilt! That back is sooooooo superb! Fabulous quilt...both sides!! I love making something fun with the extras that seem to be made when I make a quilt! Those extra triangles, put together like you did, would make a really fun border too! Definitely on my to-do list!!! It's (they're) really quite stunning -- it'd be interesting to explore the concept for the back as a standalone for sure! Wow, great job. I think I would have made 2 quilts, front and back are stunning. I love this post!! 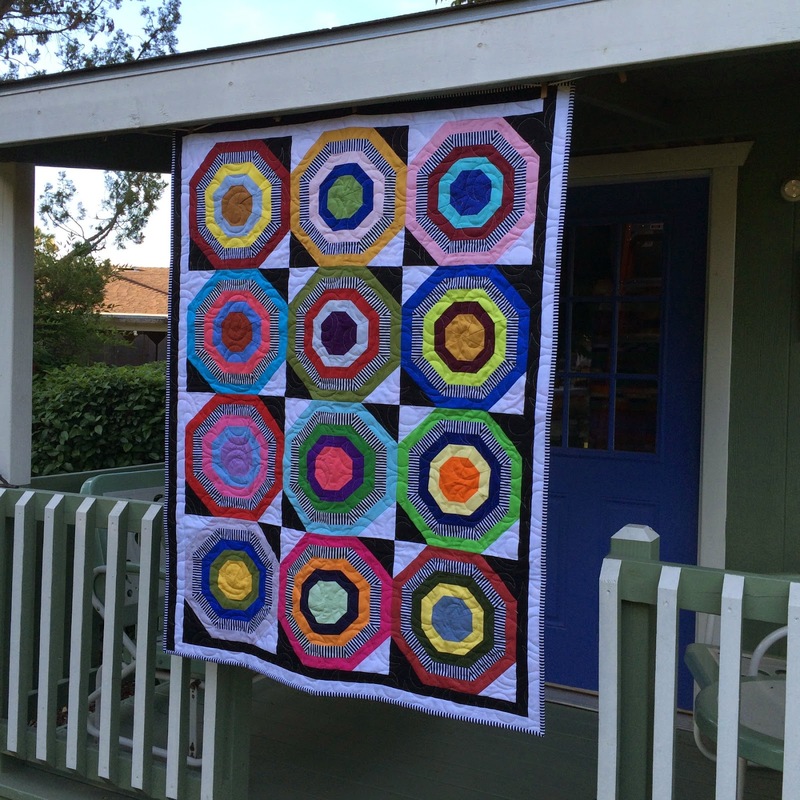 So fun to see your Bullseye quilt all done up, and yes, we ALL love that back of yours. 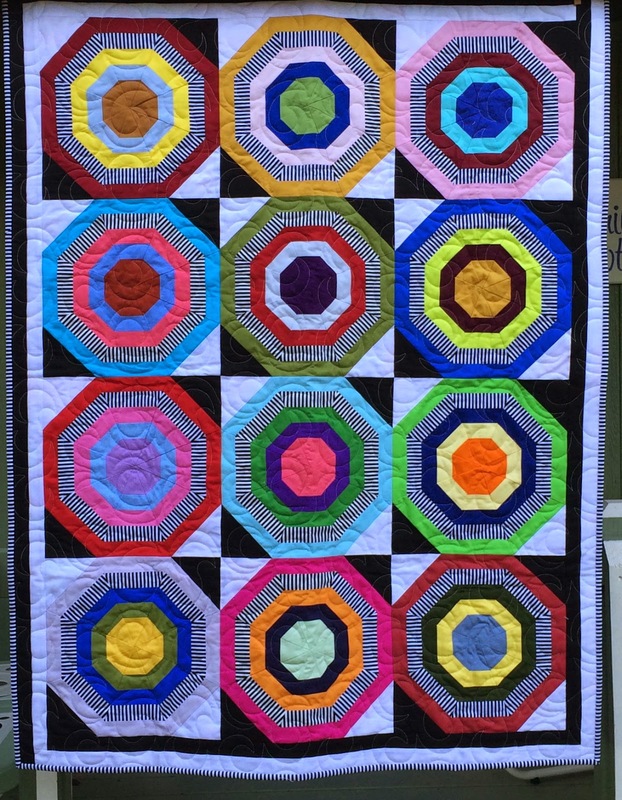 Terrific quilt, Cindy, and a terrific post. I can't decide which quilt I like more! Great quilts, and thanks for the how-to!